If you are like millions of other graduates, you might've experienced sticker shock when you received your first student loan bill after graduation. While taking out a student loan to complete your degree seemed like a good plan at the time, you might be having some regrets when faced with the monthly payments. Thankfully, there are a lot of careers that offer student loan forgiveness. Look into one of these fields to kiss your student debt goodbye. Full-time positions at AmeriCorps and Peace Corps. It is hard to feel like a successful doctor when the majority of your paycheck goes to your student loan repayment. Thankfully, you can find a list of scholarships and Federal loan forgiveness programs through the Associations of American Medical Colleges. Many of the loan forgiveness programs for doctors require employment in a Health Profession Shortage Areas (HPSA) or a Medically Underserved Area. The National Institutes of Health (NIH) offers up to $35,000 per year in loan repayment for highly qualified health professionals going into biomedical or biobehavioral research careers. You can also take your stethoscope overseas and qualify for loan forgiveness through the military service. The Navy Financial Assistance Program offers tuition coverage for current medical students, as well as student loan forgiveness or grants for those with their medical degree. Teaching is a calling, and many people feel the call to instruct the next generation. So it's only fair that the government helps lighten the debt load of those devoted to teach. Teachers can gain loan forgiveness through the same public service loan forgiveness programs mentioned above. Teachers also can qualify for the Federal Teacher Cancellation for Perkins Loans. For teachers with a Perkins loan, 15% of your loan can be canceled when you teach for one year in a low-income area. If you teach for five years, your full loan will be forgiven. Tempted by earning big figures down the road, many potential lawyers take on huge amounts of debt to make their career dream come true. Luckily, there are a few student loan forgiveness programs available just for lawyers. Attorney Student Loan Repayment Program: In order to retain lawyers in the field, current employees are able to apply for the assistance program. Only certain loans apply, and current employees must have at least $10,000 in federal loan debt to qualify. To see which loans qualify, visit Justice.gov for more information. John R. Justice Student Loan Repayment Program: For lawyers working in the public sector, the John R. Justice Student Loan Repayment Program offers $10,000 to $60,000 in loan forgiveness to eligible lawyers working as public defenders. Herbert S. Garten Loan Repayment Assistance Program: This program awards 70 attorneys up to $5,600 in award money each year for student loan debt. This award comes with more strings than the other two. Eligible candidates must be employed by one of the program's grantees and have at least $75,000 in outstanding loan debt. Future dentists, here is something to smile about. You can also qualify for loan forgiveness on either the national or state level. National programs include service with the military. The Army offers the Active Duty Health Profession Loan Repayment Program (ADHPLRP) and the Healthcare Professionals Loan Repayment Program (HPLR). The Airforce offers Air Force Active Duty Health Professions Repayment Program (ADHPLRP). All of these programs offer up to $40,000 to $50,000 in debt repayment per year. Research each individual program to know about maximum caps, eligibility criteria, and other benefits. And the American Dental Association has a full list of state-level programs that offer loan forgiveness. It's important to note that many of these careers cannot grant student loan forgiveness if your loan does not qualify. This means that if your loan is in default or in a grace period, or you are still attending school, companies may not be able to make qualified loan payments. Also, most student loan forgiveness programs are for federal loans only, and private student loans will not be forgiven. Finally, inquire with your college or university's financial aid department for more available loan forgiveness programs. 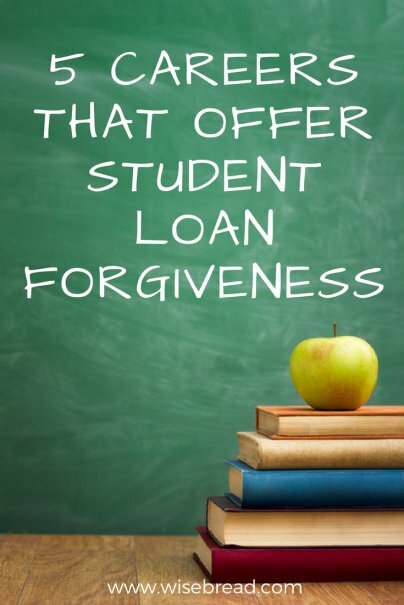 Are you planning on using loan forgiveness for your student loans? Share with us!